We are able to arrange quotes for the supply and installation of new beach huts, including the removal and disposal of existing beach huts. We offer a variety of beach hut styles and designs to suit different beach hut resort specifications and can deliver throughout the UK. As an example, a new beach hut to meet the specification for Felixstowe can be supplied and delivered for prices starting at £850. We are then able to offer additional services for beach hut resorts within Suffolk and Essex if required, such as the installation of the new beach hut, painting and fitting out. For a Free quote on a new beach hut, please contact us by clicking here and filling in our contact form. 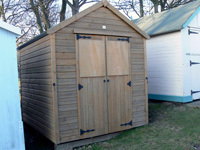 Click here for further information on our beach hut repairs and maintenance services.